Forgive me readers, but it is nearly a year since my last blog post. Quite happy to say some Hail Marys or do other forms of penance. I published a novel in February, as you’re know doubt aware (smiley face), and I’ve been trekking all over the country promoting it, so it feels like I’ve been talking non-stop even though this blog has been on radio silence. Speaking of radio silence, let’s talk about the Dish! Readers of The Lucky Galah will know that the Dish is one of my characters. The Dish sends and receives messages from Lucky the galah, and that’s how they discover more about what’s going on in the town of Port Badminton. 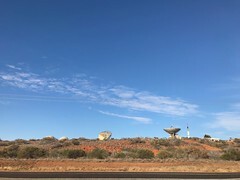 In April, I went back to the Source, which is the big satellite dish that sits on the red sand dune on the outskirts of Carnarvon. That Dish is the inspiration for my Dish, and Carnarvon is the inspiration for Port Badminton. And the whole place is infused with the culture of the Yinggarda people who have lived there on Yamaji Country from time immemorial. I flew from Perth to Carnarvon on an expensive Skippers flight (the frequency and affordability of flights in and out of Carnarvon has been a vexed issue; the service has now been taken over by Rex). 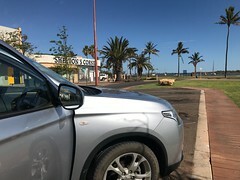 I hired a silver Mitsubishi Outlander and even before checking into the caravan park, began to trawl around the sites that are now woven through my being: the One Mile Jetty, Pelican Point, Dwyers Leap, the Gascoyne River, Chinaman’s Pool, the Dish, the Fascine. Once again I was drinking the water of this place, eating its food and scuffing my feet in its pinky-yellow sand and gravel and red dirt and patchy grass. Now, three months later, in the depths of a Bathurst winter, I’m constantly thinking my way back across the continent: back along the long roads, the hours of airtime, the view through the window of a Qantas plane into pure pink sunset, the Skippers terminal full of working men in high vis on their way to the mines up north. Thinking my way back across the continent of Australia, the world seems big again; sitting slumped at a computer screen with Donald Trump and Vladimir Putin in my face, it feels alarmingly small. I want to get back to the uncluttered bigness of Western Australian skies, where the world returns to mystery and possibility. An adventure. I headed for the One Mile Jetty first, as if paying respects to a venerable relative. There it was, with time collapsing in the familiar feel of the wind, the smell of seaweed. The same and yet different. The long finger out into the Indian Ocean is closed to the public now. It’s all boarded up, the hoardings covered with posters telling of the sea creatures hereabouts: parrotfish, manta ray, mulloway, crayfish, nudibranch, blue swimmer crab, bottlenose dolphin. In the middle there’s a small square window cut into the board that you can step up to and peer through. You get to see it again, stretching out into the sea just as it always did, only it’s old now, and so weak that you’re not allowed to set foot on it. 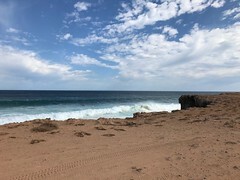 Next, I drove in to Dwyers Leap at the mouth of the Gascoyne, where decades of flood have altered the lines of land and water since we were there among the speedboats in our coloured terry-towelling hats. I watched the sunlight sparkling on water just as I did as a child. Standing on the rippled silt, I got a call from Les Bateman who’d worked at the Tracking Station in the 1970s. I’d been going to spend more time just mooching around by myself, marinated in memories and familiar sensations, but now I decided to head up to the Dish. 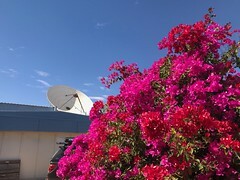 There it was, with the Space Museum at its foot, a riot of bougainvillea around the entrance. Carloads of visitors were going in and out. Les took me down to a small building below the main complex, tiny with a domed roof, a bit like a Dalek. Here, I discovered that space science on this red sand dune is still alive after all. There were two scientists crammed into the structure as big as two back yard toilets stuck together, with a ladder up to the domed area above. 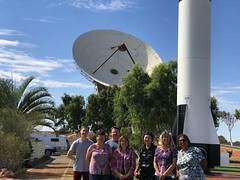 Steven Hale and Eddie Ross from the University of Birmingham were in Carnarvon in April to tend equipment measuring seismic activity on the sun (the “earthquakes” of the sun, or “helioseismology”). When they’re not around, Les Bateman, who lives in Carnarvon, looks in on the equipment to make sure it’s still working. The station is part of the Birmingham Solar-Oscillations Network, aka BiSON. Steve and Eddie had a stuffed toy bison on the desk as a mascot, which they brought outside with them when I lined them up for a photo. Steve and Eddie quietly come and go from the Carnarvon station (there are other BiSON stations dotted around the world and there’s another one in Australia at Narrabri in New South Wales) staying at what used to be called Tuckey’s Flats, now Carnarvon Central Apartments. After that, I continued my lap around the old haunts. The old prawning jetty (let us pause to acknowledge the fictional Kevin Kelly) dissolving into the sea. Samphire flats, mangroves. A mother and small child playing on the shining wet sand in the last light at Pelican Point. The Fascine, that sweep of sea wall at the bottom of Robinson street, has had a make-over. It has a twenty-first century look about it now, although the improvements used a type of metal that is already starting to rust. The new sea wall respectfully skirts around the old T-jetty where we used to catch puffed-up spiky blowfish and maybe – like the kids in The Lucky Galah – we threw them under the wheels of passing cars to hear them pop. On the Saturday, having teamed up with a couple of old school friends, Tricia (who flew up from Perth) and Ellen (who still lives in Carnarvon), I gave an author talk at the Space Museum. There was a momentary panic when I had Tricia and Ellen dashing around town looking for the morning tea. (I’d organised cakes and sandwiches over the phone from Bathurst, neglecting to pay attention to exactly which bakery I was ordering from.) They got back just in time with the foil-covered plates. The scientists from Birmingham University came along, as did school friends Noelene and Jackie and a few others. A small audience, true, but that was okay because I was hitting a Major Life Goal Bucket List Cross-Off. I was at the Dish with my own published novel in hand. Win! I’d over-catered, but as we left I noticed Museum visitors enjoying the left-over cake. Tricia and Ellen and I headed for Quobba Station north of the Blowholes. We stayed in a chalet and communed with the crash of the ocean and giant golden-orange sunsets streaked with blotches of grey cloud. On the beach, I crouched down to admire the giant clam shells like the ones Mrs Boon used to paint scenes of the Blowholes on. We had the idea to do a day-trip to Coral Bay on the Ningaloo Reef where you can swim with whale sharks. We wouldn’t swim, though, we’d just have lunch there. The sensible thing would be to head back out to the sealed highway and head north that way, but seeing we had a four-wheel drive, why not take the dirt road that hugs the coast? We were, of course, out of range of Google Maps. The dirt road went on and on and on, sometimes juddering over corrugations, sometimes threatening to consume the Outlander in soft drifts of sand. Western Australia is a giant and it doesn’t care about three women in a silver Outlander. What if we broke down? I started to berate myself for being just like the stupid tourists who drive into the outback in their air conditioned cars, break down and die a horrible death before anyone can find them. But then, finally, the great stone archway of Gnarloo Station hove into view. It was still a rough old ride to the homestead, but it gave us a renewed sense of destination and purpose. 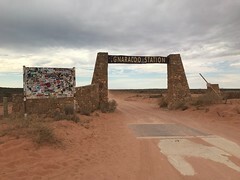 At the homestead, we were told that the track between Gnarloo and Coral Bay hadn’t been used for at least a decade. Oh well, forget Coral Bay. Let’s check out Gnarloo! Gnarloo was strange. This was new territory, a place I’d never been before. The land rose like a great pink wave from which you looked down into a valley studded with bands of hardy goats. Beyond that rose another wave, this time of pure sand dune. It was dramatic and slightly unnerving. All around, there were stone chalets being built as the station diversified from livestock into tourism. The chalets were made out of the same pinkish rock as the surrounding landscape. It felt like a scene out of a science fiction movie. We made our way back to the more familiar landscape at Quobba, and another evening of sunset, crashing waves and memories. Names, families, comings and goings, hatchings and matchings, the answers to some puzzles, the deepening of certain mysteries. Back in town, Tricia and Ellen performed a re-enactment of a photograph I took of them in Year 11, standing near the gate at the high school. We examined the plaques marking the spots where time capsules had been buried. The solid mid-century brick and tile state high school building will be vacated at the end of the year. Beginning in 2019, students will start attending classes at what used to be East Carnarvon Primary School, now called Carnarvon Community College and catering for Kindergarten to Year 12. On its website, the WA Department of Education calls this “a process of vibrant change”. Will they be sure to carry the time capsules – such symbols of hope for the future – off to the new campus? Tricia and I went fishing among the mangroves on the north side of the river in honour of our late fathers, who loved to fish. Tricia bought a good knife, hand lines, bait. We stood amongst the mangroves and cast out, only to feel the fish nibble daintily at our hooks and swim away freely. “I feel like we’re just feeding them,” said Tricia. We were perfectly happy with that. Alone in the Outlander, I continued my moochings around town. Here’s the Little House on the Highway which seemed so far out of town then. Here’s our place in Hill Street overlooking the oval. Here’s how I walked to primary school and later, to high school, past the hostel where station kids boarded. I walked from the Fascine across the old wooden bridge to Babbage Island, past people fishing from camp chairs, all the while following the old train tracks used to take bales of wool from Camel Lane across Babbage Island and then out to the end of the One Mile Jetty. The old tracks were still there, sometimes twisted or covered over with sand. When I got to the One Mile, tourists were looking forlornly at the boarded up entrance. I had a coffee at the cafe and enjoyed the scenery, including a diagonal view of the white-painted jetty going out to sea; from this angle you wouldn’t even know it was closed. And I wandered all around the back of the Cafe/Museum complex, picking through the tangle of wood and metal remains of the glory days of trains and shipping and cargo and all the people and animals that used to come and go from this spot. I remembered how a circle of these flat wagons used to be out at the Pony Club; we’d run across the top of them, leaping from wagon to wagon. I parked the Outlander on the road opposite The Little House on the Highway where we lived next-door-but one to the Thomases (note: the Thomases and the Sorensens are nothing like the Kellys and Johnsons of The Lucky Galah except in one respect: the Thomases had a giant wooden fork and spoon hanging on the wall, which I found a little Jack-and-the-Beanstalk freaky). On the Tuesday, the day before Anzac Day, I did a second author talk, this time at the Library. This was very special. As you might imagine, I loved the library as a child. It was presided over by Mrs Dupree, who seemed strict and ancient but would unexpectedly smile at you. We’d get craft books out and go home and attempt the crafts. My sister Deb named one of our new grey kittens Abdul after the cat in the library book Abdul the Grey. But I wasn’t returning to that exact place to do my talk. The Library and Art Gallery are now housed in what used to be the squash courts. There was a bigger audience this time, thanks to the Library’s promotional efforts. It included Val Jolly of Jolly’s Tyres, where Dad worked for a while in the early 1970s and Enga Smith, who wrote Saddle in the Kitchen with its cover illustration by my old art teacher, David Bornshin. People were keen to chat with Tricia, whose family (the Fongs) ran Fongs Drapery and Haberdashery on the corner of Francis and Robinson streets for decades. That evening, Tricia and I went back to the Library for a presentation by health writer Melissa Sweet who had recently completed a doctorate focusing on the lock hospital era. The audience was made up of Aboriginal people who had advised her, plus some non-Aboriginal townspeople and a few “strays” like Tricia and I. Island lock hospitals like the ones on Bernier and Dorre Islands off Carnarvon are a sad and sorry part of Australian history. 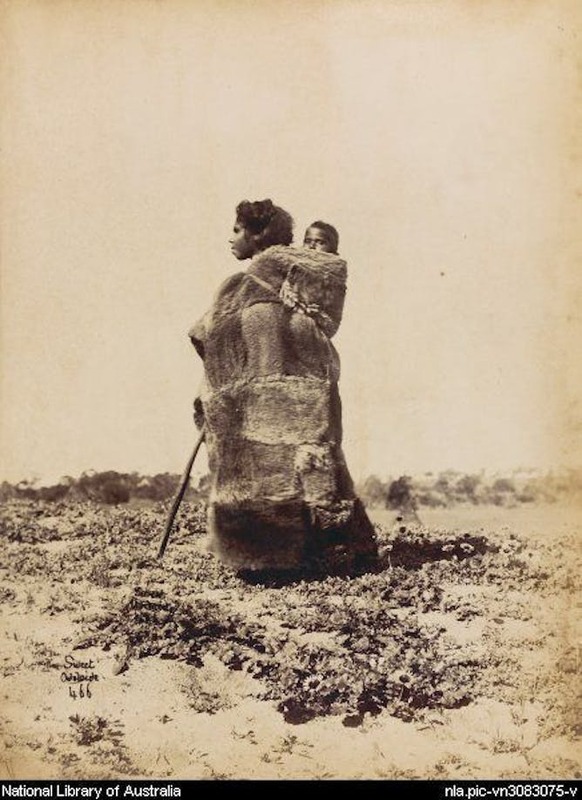 The rounding up and imprisonment of Aboriginal people, many of whom were not actually ill, can only be described as barbaric. “It was a land grab,” said elder Raymond Edney simply and directly. “We’re still feeling it,” a couple of the women said. 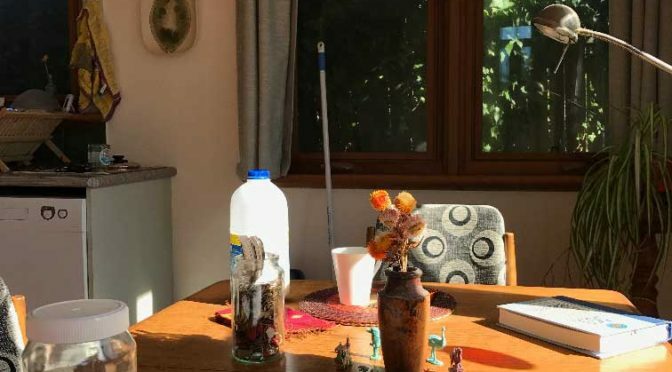 The meeting was attended by Bob Dorey and Kathleen Musulin who appeared with musician Peter Garrett on the SBS episode of Who Do You Think You Are. That episode focused on Garrett’s grandmother’s time as a nurse in the hospital. Kathleen Musulin’s great grandmother was incarcerated in the lock hospital. She is now part of a working group tasked with creating a memorial to acknowledge the pain and suffering wrought during that era. My last full day in Carnarvon was Anzac Day, with the townspeople gathered around the War Memorial. We got up for the dawn service followed by bacon and egg rolls at the RSL Club. Tricia got chatting about history with the Shire President, Karl Brandenburg, who invited us to have a look at the display of historic photos in the Council chambers. As it turns out, the Council is now housed in the building that was the Library when I was a kid, so I got to snoop around in there after all. There, on the walls, was a display of all the iconic places I’d woven, in fictional form, into The Lucky Galah: the Fascine in different incarnations over the decades, the One Mile Jetty in full swing, the first truck to take bananas to Perth by road, the Dish when it was first built, NASA people at the tracking station in the 1960s. From the outside – if you’re just gathering supplies from the supermarket as you head further north in your camper van – Carnarvon admittedly doesn’t look like much. It’s just another small Australian town fighting for its life. From the inside, for those who live there or ever lived there, it is unforgettable. Its isolation, small population and giant landscape combine to create lives that seem hand-made out of the earth, sea and sky. I’ve taken some of this material and woven it into a work of fiction. I know I’m treading on unsteady ground here. People can get very upset with how you represent them. The Lucky Galah is not all beer and skittles. It encompasses darker corners of Australian life and politics and psyche. The risk of being excommunicated is ever-present. It may be one of the reasons I’ve taken so long to write this post. I wasn’t quite sure where I stood. But you can never be sure where you stand. The river rushes on, the sea smashes into rock, history is made and forgotten. You’re just part of it all for a while. 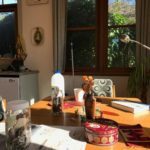 This entry was posted in Carnarvon, family, Fiction, friends on July 22, 2018 by Tracy. Over on the other side of the continent and half way up, a mile long jetty reaches out into the sparkling Indian Ocean. Thousands of stories are held on those creaking timber boards. Dad is sitting in the car in the main street, having just arrived from a year-long stint on a dairy farm down south. 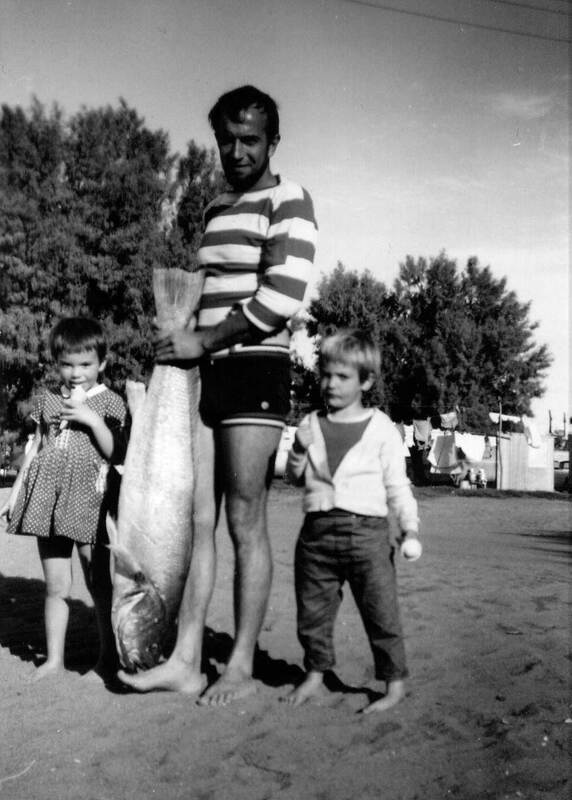 He notes an Aboriginal boy with a fish almost as big as he is, slung over his back, going into the Port Hotel. When the boy reappears, sans fish and presumably a little money in his pocket, Dad asks where he got it. The boy points in the direction of the One Mile Jetty. Did Dad walk out on that mile-long jetty by himself, or were we – Mum and my sister Deb and I – all in tow? I think he went alone. 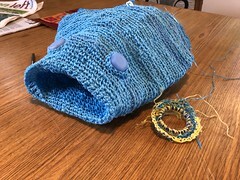 It took no time at all to land the big one. I imagine him now, a man in a striped shirt and stretchy black swimming costume, carrying his fish all the way back to shore. Mum took a photo of Dad with Deb and I standing either side of him, each holding an ice cream cone. In pride of place in the centre there’s the fish, taller than five-year-old me, its nose balanced on Dad’s bare foot to keep it out of the sand, tail held firmly in two hands. We stayed on because of that fish. We stayed on in the little town between the red desert and the blue sea with the great bowl of blue sky overhead. The air was thick with insects; the bush thrummed with life; little brown birds hid in acacia shrubs and called out in a circular, taunting trill: Did y get drunk? Did y get drunk? The One Mile Jetty became as familiar as our own backyard. 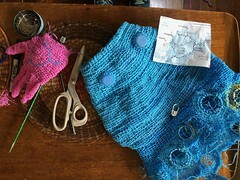 We’d push an old pram full of fishing gear out across the old hardwood planks, over the tidal mud flats and mangroves to the deep blue-green sea that slapped on the pylons. You could lean up against the old shed out at the end, to get out of the wind; or you could stop fishing and clamber down to secret places underneath, to get closer to the water and study barnacles. The fish were easy to catch. I learned to distinguish desultory nibbles from the thrill of a good hard tug. As a nine year old I could land, kill, gut and scale a fish. Returning home, our two grey cats would be waiting impatiently for us. We’d fry and eat our fish for dinner. The jetty was part of our pantry. Earlier this year, Mum and I walked out on it together, decades after that day with the giant fish. We smelt the air again, and heard the slapping of the water on the old pylons, and remembered. For Tom Day, a man of an earlier generation, the jetty was piece of vital transport infrastructure, the docking place for weekly visits from the state shipping line. 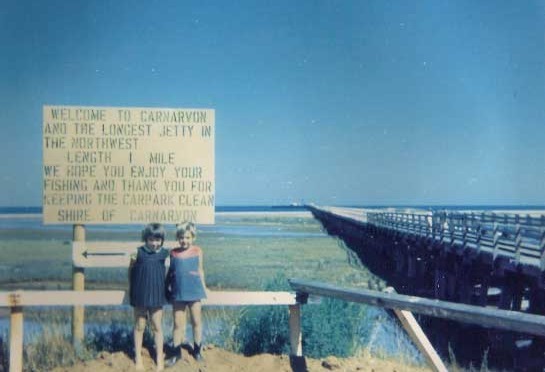 From the earliest days of the Carnarvon township until the early 1960s, the only regular transport in and out was by sea. “It’s part of our history,” he told me by phone today. “We used to travel to Perth on the state ships. It’s an icon of the town, and it’s the only timber jetty left in the north.” A mural on the Civic Centre in town shows the scene at the end of the jetty when a ship came in: a kaleidoscope of movement and colour, people and animals and things. Over the years visitors, townsfolk, shearers, sheep, wool, food, mail, fabrics, bananas, newspapers and magazines all came in and out of town this way. Once the road was sealed all the way from Carnarvon to Perth, semi-trailers took over from the ships. The jetty’s new life as a drawcard for fishing and tourism began. And there is a darker note in the jetty’s history. It was from here, between 1910 and 1916 that Aboriginal people, many in chains and handcuffs, were forced on the boats that took them to the infamous lock hospitals on Bernier and Dorre Islands. But now the future of the jetty, with all its interwoven layers of history and personal stories, is in doubt. 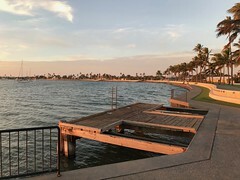 Consultants hired to assess the condition of the jetty and report on maintenance requirements took the unusual step of requesting that it be closed immediately due to safety concerns. If money can’t be found to repair it, the closure will be permanent. The jetty’s decline has been a long time coming, hastened over the years by a couple of devastating fires lit by vandals. But an army of volunteers has worked tirelessly to care for the jetty, raising funds for maintenance and driving tourists out and back on the little “coffee pot” train. Tom Day, now the chair of the Carnarvon Heritage Group, said he refused to take a “defeatist” view. “If you believe in something you need to stand up and say so,” he said. As we spoke, he was in the process of organising a public meeting in town to show community support to save the jetty. This entry was posted in Carnarvon on August 30, 2017 by Tracy. It bothered me that they didn’t have eyes. There they were, a man and a woman sitting at a tiny table smiling at each other with no eyes. Their smiles were so big they reached almost to the temples. And their legs had no feet. They ended in sharp points, like stakes to be driven into the ground. 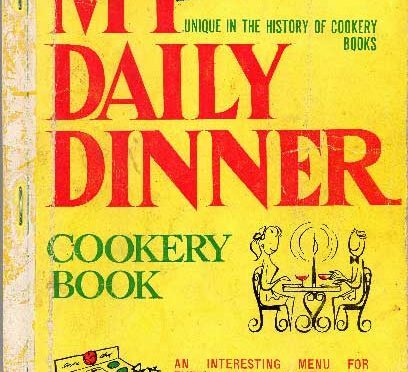 They sat on the cover of Mum’s slim yellow cookery book, My Daily Dinner, acquired around the time of her marriage in 1961. I read it, on and off, over the years. How to deal with an old fowl. – A quite old fowl is very nice boiled. And I’d move on to the recipes for brain rolls or stewed tripe. I read and reread it the way I read the other books that lay about the house. 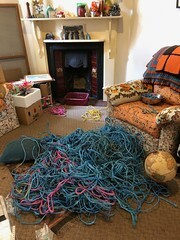 These included a rude one called Laughter Between the Sheets which was kept under other things in the sliding-door cabinet in the lounge room. 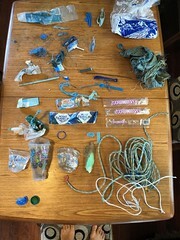 (We found all hidden things in the house, without exception.) And there was Strange Stories, Amazing Facts from the Reader’s Digest in which the image of a dead person kept appearing in the lino on the floor, no matter how hard the cleaner tried to scrub it off. For me, My Daily Dinner was reading material for mooching, listless afternoons. I wasn’t thinking about the act of cooking. I was thinking about the old fowl or the brains. Leafing through it now – not Mum’s original one but an old copy I found myself – I see that its purpose was not connected to idleness but to industry and thrift. It was a how-to manual for getting something on the dining table day after day after day. And now I see the connection with the things that actually appeared on our table. There’s the bread and butter pudding. There is the hot chocolate sauce we poured over vanilla ice cream. There is all that offal: the tripe, the brains, the liver (lamb’s fry), the kidneys, the tongue (yes, I remember a large tongue with its own thick pitted skin), the lumps of corned beef boiled forever and served with a white sauce. My Daily Dinner is big on white sauce. It’s big on flour in general. Mum was forever dredging things in seasoned flour and frying them. Everything was thickened with flour, dotted with butter. Puddings were endless variations on flour and sugar. The apple roly poly, the star dessert of my childhood, is not in My Daily Dinner. There is a jam roly poly, but that’s not what we used to have. Our roly poly had slices of apple rolled up in a scone-like dough with water and sugar poured over it and baked to create a caramelised self-saucing sensation. Eaten out of the mustard-coloured Bessemer bowls I still remember arriving new in the box. I don’t think Mum ever attempted to follow a complete suggested menu; she took inspiration here and there. The complete menus, building day by day, were about eking out food, making it go further; about using animals from snout to tail because that’s how you could feed a family on very little money. The menu for the Friday of the third week of the winter is this: Sheep’s head broth (made with stock from the sheep’s head you boiled for dinner yesterday) followed by scalloped fish (a small amount of fresh fish stretched out with white sauce and baked) served with potatoes (an all-white main course) finished up with half pay pudding. The half pay pudding is a concoction of flour and currants steamed in a pudding cloth for three hours. Very good results are obtained by mixing the pudding with one cup of cold tea. This makes it more economical. My Daily Dinner was published by the magazine New Idea, which in those days was all about knitting patterns and household hints. Now New Idea is a mess of celebrity gossip in a world of criminal excess, in which, it’s estimated, Australians throw out eight billion dollars worth of food every year. But women have it better than they did then. They’re not spending the afternoon fiddling with sheep’s heads: Get two sheep’s heads or lambs’ heads, soak them well in salt and water, and rinse thoroughly. Cut the sides apart, separating the tongues, and take out the brains. Then again, some people are rediscovering such activities, as a way of combatting food waste. But tripe. Is anyone going to go back to tripe? Stewed tripe: – Get one and a half lbs. thick, seamy tripe, wash, and cut in neat pieces, not too small. Cover with water, and add one dessertspoon salt; boil gently for two hours. After one hour place six peeled onions on top of the tripe. When cooked, pour off most of the liquor, and add one cup of milk. Bring to the boil and thicken with one tablespoon flour mixed to a paste with a little cold milk. Add a small piece of butter just before serving on a hot dish. This entry was posted in books, Carnarvon, family and tagged Apple roly poly, Bessemer, My Daily Dinner, Tripe on July 1, 2017 by Tracy.